You really have to use your gourd to eat healthy and clean during pumpkin spice overload season. Temptations abound to threaten your resolve for maintaining a diet that will accomplish your fitness goals. Yet you don’t need to lock away all your favorites while everyone around you enjoys the sweet and unique flavor of the world’s most beloved gourd. There are plenty of ways to get your fill of pumpkin spice while sticking to a food plan you can be proud of! These healthy recipes can give you a starting point for whipping up your own pumpkin spice creations! While some may contain just the infamous and delicious pumpkin spice, others may include pumpkin itself. Don’t forget to buy pure pumpkin purée instead of pumpkin pie filling. Pumpkin is a great source of potassium, vitamin A and iron, whereas pumpkin pie filling is packed with sugars and other additives you may not want. One of the most popular ways to enjoy everyone’s favorite fall flavor is the much-hyped pumpkin spice. But what is pumpkin spice? 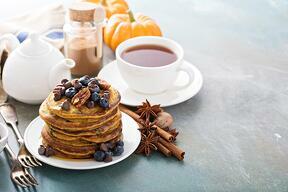 Well, in many cases, for example at a popular coffee chain, it is a syrup full of sugars and preservatives. A 16 ounce latte, even using the lower calorie 2% milk, packs a whopping 380 calories. Companies like these would like you to believe it’s a magical concoction that only they can create, it’s easy as pie to make your own healthy pumpkin spice to use in your own recipes. Mix up ground cinnamon, ground ginger, ground nutmeg, ground allspice, and ground cloves in the proportions you like best for your own fragrant, heavenly spice blend. What about the pumpkin spice coffees and creamers you hear so much about? Those, too, are typically laden with sugars and preservatives. 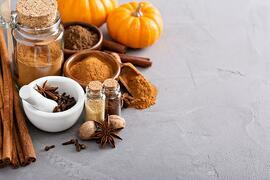 You can create your own healthier pumpkin spice coffee creamer to use in your favorite coffee. Heat over low to medium heat until the mixture is warm through. Allow it to cool to room temperature, then whisk again. Whisk together the dry ingredients, excluding the sweeteners, in a small bowl. Combine wet ingredients in a separate bowl. Mix in the Swerve and the Truvia until they dissolve completely. Add the dry ingredients to the wet ingredients and stir until they are completely incorporated. Allow the cookie dough to rest for 10 minutes. Preheat the oven to 325 degrees. Prepare a baking pan with either a silicone baking mat or parchment paper. Dropped well-rounded scoops of the cookie dough onto the pan and flatten until they are your preferred thickness. Bake for 11 to 13 minutes and let them cool for at least 10 minutes on the baking sheet before you put them on a wire rack. And don’t forget the classic fall dessert - pumpkin pie! Try a fun spin on a classic; make a healthier version using this dairy-free and gluten-free, paleo-friendly recipe for pumpkin pie bites and indulge without regret! Thoroughly mix all of the crust ingredients first. Place muffin papers in a muffin tin, and press a spoonful of the crust mixture firmly into each cupcake paper. While the crust is baking, mix the filling ingredients thoroughly in a bowl. When the crust is finished, spoon the pumpkin filling mixture into each cupcake holder evenly. Bake for 20 -30 minutes, or until slightly firm to the touch. Don’t forget that Jax Nutrition also stocks our own healthy treats and we will be rotating seasonal favorites, so stop in to check for healthy pumpkin spice treats like cake pops and donuts! One of the best gifts you can give yourself this season is the gift of good nutrition. Let Jax Nutrition help you reach and maintain your holiday health goals!